The Cassini spacecraft, part of the international Cassini-Huygens mission, is due to start a series of 22 orbits in between Saturn and its rings today, the 26th of April. The ring plane passages pose the final challenge of the mission: having orbited the planet for the last 12 years the spacecraft is set to enter Saturn’s atmosphere on September 15th. The data gathered in the revolutionary maneuvers are expected to further expand our understanding of the Saturnian environment and the origin of the planet and its rings and moons. Already in 2005 the Huygens probe touched down on the Saturnian moon Titan, which has lead to the insight into its many atmospheric and internal processes. From the combination of the in-situ data recovered by the Huygens probe and remote observations performed by Cassini during various flybys many revelations followed on its Earth-like hydrological cycle. The key component is however not water but methane due to the -180°C surface temperature. 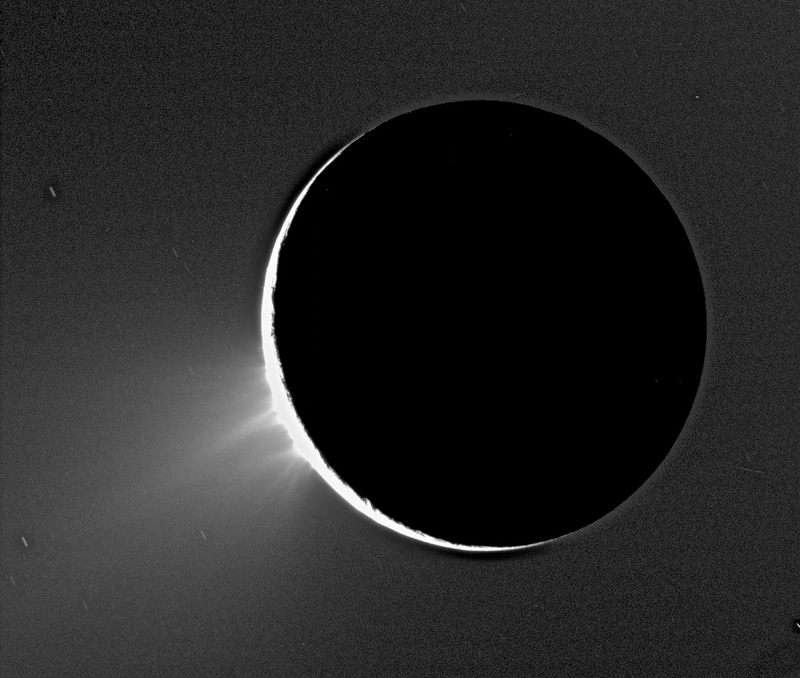 Water vapour jets on Enceladus, captured by Cassini. Copyright NASA/JPL/Space Science Institute. Other discoveries fuelled by the Cassini-Huygens mission include that of water vapour plumes that spray organic material into space from surface fractures on another moon of Saturn, Enceladus. Complementing measurements on the moon’s rotation and gravity field the plumes are an indicator of a subsurface ocean of liquid water. The materials that are expelled into space also have been shown to include hydrogen gas. This suggest ongoing hydrothermal reactions between seafloor rocks and warm water which in its turn could provide a source of energy for life. Over the coming months Cassini will take unique measurements of Saturn’s gravitational field and magnetic field. These observations are believed to lead to new insights into the gravitational interaction between the planet and its rings enabling accurate weight estimations of the latter. Also new theories can be developed to explain why the planet’s magnetic field is weaker than expected and why its magnetic axis aligns so well with the planet’s rotational axis. With the Cassini-Huygens mission that has formed the foundation of research in the Saturnian environment now drawing to a close, multiple other concepts have been proposed to further explore the Saturn and its rings and moons. However no definitive plans have been made yet to revisit Saturn in the near future. Read all about the Cassini-Huygens mission here.